In my previous articles Pattern-type (Part 5): Scaling in/out based on your own monitoring collector with SmartCloud Application Services I explained how to Scale in/out using your own monitoring collect (ie: counting files in a directory). In noticed in the documentation (IWD Infocenter) at the end of the page a mention of a ‘CPU’ category and ‘Used’ metrics. This let me think we can re-use some embedded OS metrics in a scaling policy and I will show here how to do it. The reuse of an existing metric requires changes in only two files and guess which one? Of course, the application model to collect the arguments of the scaling policy and the topology file to define the rules and implement this policy. In the application model file, we have to define the scaling policy and capture all arguments for this policy. This is very similar of what we did in the previous article when we define the polity for our own monitoring collector but here instead of defining a number of files and a directory to monitor attributes, we will define a ‘cpuUsage’ attribute which will be a percentage. "description": "Specifies the CPU threshold condition to start scaling activity. When the average CPU utilization of your application platform is out of this threshold range, your platform will be scaled in/out. The default value is 20% - 80%. Acceptable values range from 0%-100%." As in the previous article we define a ‘policy’ type element which will be applied to the ‘Server’ role. 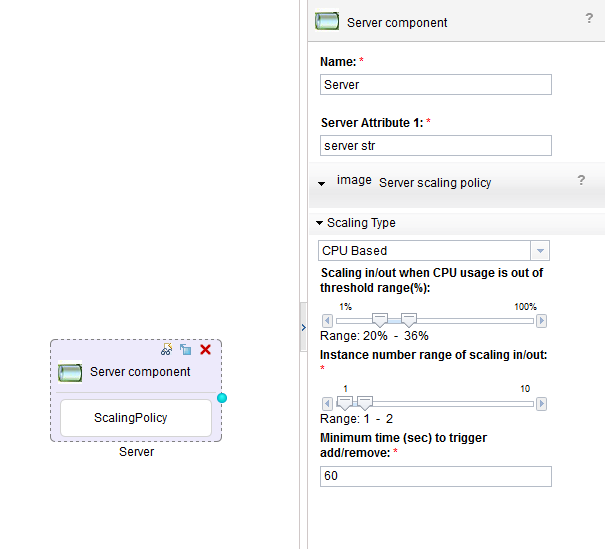 In this policy we have two groups one for a ‘Static’ scaling policy and another one for a ‘CPU Based’ policy. For the last one we define three attributes: the ‘cpuUsage’, ‘scaleInstanceRange1′ and the ‘triggerTime1′ attributes. You can choose the name you want, the only important thing is that these name must match an attribute id in the attributes list defined after that. The order of the attribute reference in the group will define the order appearance in the pattern editor. We are done with our application model. Let’s look at the topology file. We have to inject the attribute captured in the application model in the topology file to define the scaling rule. This is done in the ‘scaling’ JSON attribute of the *.vm file. We will use velocimacro to insert or not elements in the topology. Note: due to editor capability, I had to replace in the snippet above the ‘<‘ and ‘>’ respectively by ‘&lt’ and ‘&gt’. First we retrieve the parameters of the scaling policy, the we test each value to know if we have to inject elements or not. If the cpuUsage is defined (thus not a Static policy) we inject the triggerEvent along with the upper and lower limit of CPU Usage to scale in/out. The key point of the triggerEvent is that we reuse the embedded metric “CPU.Used”. As soon as I know other metrics, I will let you know but you can always check the IWD documentation which is frequently updated with new information. Then we inject the other attribute value, ‘initialInstanceNumber’, ‘scaleInsanceRange1′ and the ‘triggerTime1′. Of course these names are the names you defined in the application model. As this collector is an embedded collector, there is no need to register it as we did in the previous article. We can reuse existing collector and thus no need to reinvent the wheel.